Photo Caption A: Students from Berkeley College receive a tour of the Brooklyn Heights Designer Showhouse, 32 Livingston Street, on November 3, 2017, from Erika Belsey Worth, Vice President, BHA Board, and Co-Chair, Brooklyn Heights Designer Showhouse (right). Presented by the Brooklyn Heights Association (BHA), the showhouse brought together 16 local designers to transform the 1867 Brooklyn Heights townhouse into a 21st century home. The Showhouse’s 16 rooms were open to the public for five weeks. 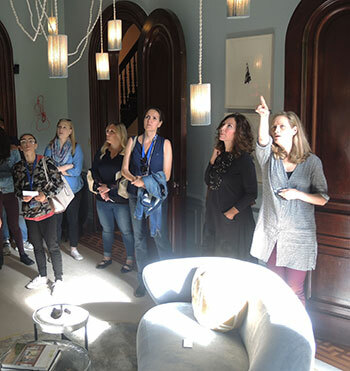 Photo Caption B: On the right, students from Berkeley College receive a tour of the Brooklyn Heights Designer Showhouse, 32 Livingston Street, on November 3, 2017. On the left, Interior Design student Clara Linares of North Bergen, NJ, observes the newly redesigned kitchen of the 1867 Brooklyn Heights townhouse. Click here for more information about the Brooklyn Heights Designer Showhouse, and click here to view more photos from the Berkeley College students’ tour. The tour was comprised of 15 students enrolled in the Berkeley College Interior Design program, as well as 12 students based in Brooklyn enrolled in other majors. For Berkeley College student Kezzisha Charles, who is majoring in Business Administration – Management, the Showhouse is a sign of hope that her neighborhood in Downtown Brooklyn will continue to develop. “It is incredible to see how new businesses and initiatives like the Brooklyn Heights Designer Showhouse are not only uniting the community within, but also bringing new people into our community,” she said. 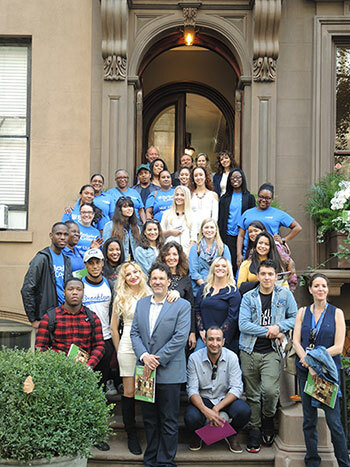 Photo Caption C: On the right, students from Berkeley College receive a tour of the Brooklyn Heights Designer Showhouse, 32 Livingston Street, on November 3, 2017, from Erika Belsey Worth, Vice President, BHA Board, and Co-Chair, Brooklyn Heights Designer Showhouse (center). On the left, Interior Design student Milena Eror of North Haledon, NJ, meets Michael Cooper, owner of the 1867 Brooklyn Heights townhouse (right). Click here for more information about the Interior Design program at Berkeley College, offered at the campuses in Paramus and Woodland Park, NJ. Photo Caption D: Students and faculty from Berkeley College receive a tour of the Brooklyn Heights Designer Showhouse, 32 Livingston Street, on November 3, 2017. The tour was comprised of students enrolled in the Berkeley College Interior Design program, as well as students based in Brooklyn enrolled in other majors.